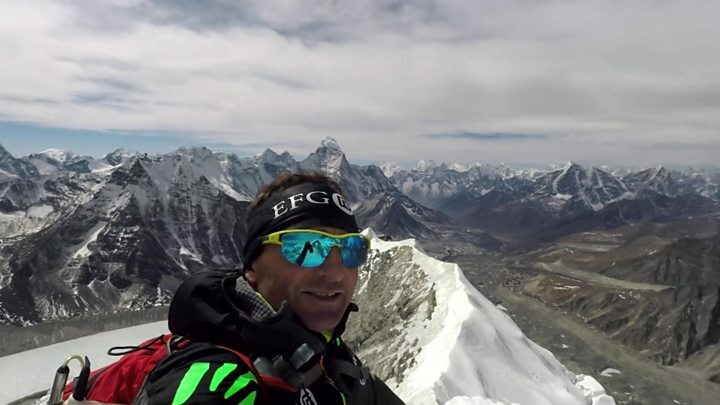 The Swiss climber Ueli Steck has been killed preparing to climb Mount Everest, Nepal's tourist office says. Steck, who was known as the "Swiss Machine", died in an accident while acclimatising for an attempt on the mountain without oxygen by a new route. The 40-year-old had won multiple awards and was known for his rapid ascents. His body has been recovered from the base of Mount Nupste, which shares a common ridge with Everest, after he was spotted by fellow climbers. "He had an accident on the Nuptse wall and died. It seems he slipped," Ang Tsering Sherpa, head of the Nepal Mountaineering Association, told news agency AFP. Steck was preparing to climb Mount Everest using its West Ridge, a route which has been the cause of more deaths than successful ascents, followed by Lhotse, the fourth highest mountain in the world. It is believed he was alone on Sunday due to his climbing partner contracting severe frostbite. On Wednesday, Steck wrote on his Facebook page that he had a "quick day from Basecamp up to 7,000m and back" as he believed "active acclimatisation" was the most effective way of getting used to high altitude. The climber reached Mount Everest's summit without oxygen in 2012, and in 2015 climbed all 82 Alpine peaks over 4,000m (13,100ft) in 62 days. Steck had returned to the world's tallest mountain four years on from an altercation with sherpas which caused him to abandon an attempt to climb Everest and Lhotse. In a video about his Everest-Lhotse project ahead of his departure for the Himalayas, Steck said he felt super-ready and psyched. "My body is as strong as it was never before," he added. Asked about his definition of success for the ambitious plans to traverse Everest and Lhotse via the Hornbein Couloir, Steck said: "If you have an accident or if you're going to die, that's definitely not successful, all the other things, it's a success already." "Why do I have to attempt Everest and Lhotse? Yet again, the answer is simple: I get to stay longer in the mountains. "And now I'll just go, and only worry about the events that lie ahead of me. Day by day, one by one. It is the here and now that counts. What comes next is uncertain in any case. Last year Steck and fellow climber David Goettler found the bodies of two American mountaineers in Tibet, 16 years after they were killed by a huge avalanche. Veteran British mountaineer Sir Chris Bonington paid tribute to Steck, describing him as "one of the great climbers of all time". He said that Steck's reputation for speed climbing had not necessarily put him at greater risk. "What kills most people is the objective dangers, going into an area where there is stone fall or the threat of avalanche," he told the BBC's Newshour programme. "The longer you are exposed to that threat, statistically the more likelihood there is of you being hit by one of these things. Whereas if you are moving very fast you are exposed to that danger for a much shorter time. "But the people who are climbing at the absolute limit, which he undoubtedly was, the death rate among the very best mountaineers is very high, particularly in the Himalayas." British mountaineer Kenton Cool described Steck as "a true inspiration" who "showed us all what was possible in the mountains and beyond". The British Mountaineering Council described him as a "legendary mountaineer and all-round great guy". Ueli Steck set new standards in alpine climbing - setting a string of records for making breathtakingly quick solo ascents of classic routes. He also played a big part in bringing the sport to a new audience through the epic films made of his exploits. He was nicknamed the "Swiss Machine" for his ruthlessly methodical approach and his ability to keep going even after pushing himself to the limits of human endurance. In 2015 he climbed one of the world's most famous walls, the North Face of the Eiger, in two hours 47 minutes - a time that would have been unthinkable to the early pioneers of the sport, who took days to complete it. In 2015, he improved on that feat with a time of two hours 22 minutes and 50 seconds.